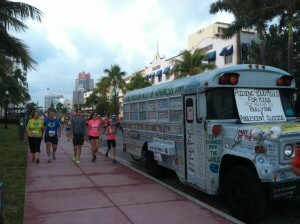 Unknowingly, The Kindness Bus was parked overnight on the course of the ING Miami Marathon. Having a captive audience of 25,000 marathoners run past was a great way to get the word out to the greater Miami community. The serious front runners cruised by with no time to spare and just took note. Many of the remainder of the group took out their iPhones or cameras and snapped photos as I cheered them on, some even took a break to pose with me. Hector and Virginia had nothing but kind words to share. Reuben who has 2 daughters in elementary schools in Miami was all about getting my message into their schools. Hundreds of conversations happened because of the marathon. There couldn’t have been a better way to start the day for One Million Acts Of Kindness. This entry was posted on Sunday, January 27th, 2013 at 8:10 am	and is filed under Kindness. You can follow any responses to this entry through the RSS 2.0 feed. You can leave a response, or trackback from your own site.